The sophistication and style of a frameless glass fence but on a budget. 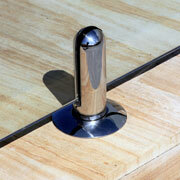 The posts are manufactured from high grade aluminium and powder-coated right here in Australia. We have a full range of standard size panels in stock for immediate delivery. Of course, we also do full custom sizes. So whatever you pool requires, we have you covered. All glass is 8mm clear toughened manufactured to the Australian Standard AS/NZS 2088 – 1996 and ALL panels are permanently marked with Lic number and applicable Aus Standard information. Gate hardware is high polished 316 grade stainless steel. All components are manufactured to the relevant Australian Standards and come with full manufacturers warranties. We are a full service company and deliver our product Australia wide. In Sydney, if your order is processed by 11:00am, then we can guarantee delivery before close of business the following business day. We have our own delivery vehicle with a dedicated driver. We can also offer a very reliable and quality installation service by professional licensed glass installers in most cities.